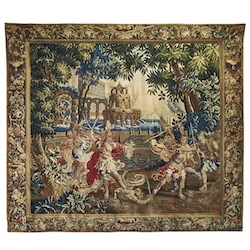 Guinevere Antiques | The Unrecognised Beauty of a Tapestry. 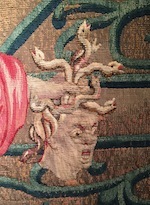 The Unrecognised Beauty of a Tapestry. I have always loved Textiles old and new, but once I started working at Guinevere (centuries ago!!) My love of all textiles grew. Beautiful vegetable dyed yarns, woven into tapestries. Reminding us of time gone by in castles and mansions. Cold, windy, wet days with barely any light, warmed up visually by the rich yet muted colours, and exciting us with a story. Tapestries have been out of fashion, but I bought some recently because I love them and I was thrilled so see that some of our clients agree with me. They are wonderful pieces of history. 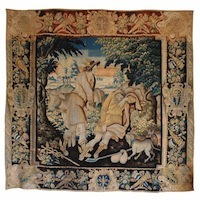 Our most recent acquisition is an early 18thC Flemish tapestry. With a rich border, where the colour has remained, the central section filled with gorgeous flowers, food on plates, a bow and arrows, crossed swords at the top and blue parrots at the bottom. Setting the scene in the middle is a cascading waterfall and a grand house in the distance to give depth. Framed buy trees, the colours of which are amazing. 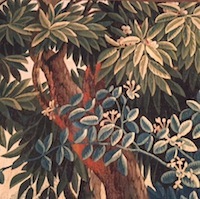 Leaves of every shape and oversized to give an element of drama, with colours ranging the spectrum of blues and greens. The tree trunks are a medley of warm browns and terracotta. The characters are all in dramatic positions, arms up, feet pointing to show movement. Their clothes are swaying too. Not to mention, the main attraction of Perseus having just cut of Medusa’s head triumphantly. He is keeping her eyes well away from the crowd, no-one wants to turn to stone. Thank you to all of you who, like myself, love a bit of drama and colour, tied together with history. Long my we continue to find them!! I have trawled the internet and found some other excellent examples of these beautiful fragments of history. 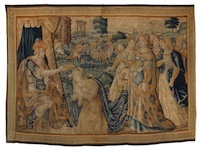 Flemish Tapestry Depicting the Crowning of Esther, late 16th-early 17th century, probably Oudenaarde. 17th Century Flemish Tapestry, “Rescue of the Nymph Io from the Giant Argus” The scene depicting a well-known Roman and Greek Myth: Hera, wife of Zeus has turned his lover, the nymph Io, into a cow and has cast her out of the heavens to earth and the garden of Nemea and ordered Argus, the all seeing Giant, to watch over her.